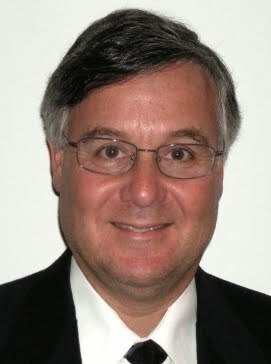 The broader issue though is channel conflict - that refers to a situation in which business partners clash in some of their operations, such as distribution networks, in such a manner that it causes stress to the relationship, effectively turning them into both competitors and partners simultaneously. A classic example of channel conflict and disintermediation made flooring industry headlines last week when BR-111 announced it would eliminate distributors, sell direct to consumers over the Internet and give a commission to the nearby dealer who lost the sale. “BR-111 says No to Distributors.” There is more than just channel conflict that makes one wonder how this story will end; the result remains to be seen. Others have tried forsaking distribution. In 2008 Faus initiated a “direct to market” concept after its major distributor, Hoboken, filed bankruptcy. This spring Faus announced that it was actively courting distributors again. Armstrong began its retailer direct program with the National Floorcovering Alliance (NFA) in 2006 and more recently with CCA Global Partners. In CCA’s case, orders will be placed centrally and order fulfillment will be carried out by their distributors. While rumors and questions persist about Armstrong’s long-term plan for distribution, this arrangement is an example of a traditional, linear distribution model moving towards a more collaborative one; something that many industries try to achieve. No company owns a right to their business. If the services you perform become outdated, the competitive market will cut you out one way or another. When Mohawk Carpet decided to follow Shaw’s lead and eliminate their 14 distributors in 1985, my company lost 60% of its sales volume almost overnight. Instantly, Misco Shawnee had to reinvent itself or become a dinosaur that had outlived its era. We redesigned the company to fit the changing needs of the market and prospered for many years, but some distributors could not change fast enough and they disappeared. The same story has happened over and over throughout the years; the key is to not be so inflexible that you become irrelevant. Consolidation has seen the flooring industry evolve into an oligopoly of manufacturers. Given the examples of companies like Shaw, Dal-Tile and Armstrong some may conclude that the future of wholesale distribution in the flooring industry is at question. But as much power as these giant manufacturers wield in our industry, they do not define the industry in its entirety. I spend a great deal of my time finding the right channels and channel partners for my clients to take products to market. Wholesale distribution remains a very important solution today for many domestic and foreign manufacturers, who without distributors, could never compete. It is a perfect marriage for distributors who need product differentiation and manufacturers who need a sales force and logistics. Have you thought about the New Consumer Frugality and what it might mean for your flooring business? Several articles, namely The New Consumer Frugality, an article from Strategy+Business, New frugality for many may outlive recession from msnbc.com and The New Frugality: Consume Less, Save More, Live Better from Wisebread, had me considering the future. It's fair to say that we are emerging from the Great Recession. We're not out of the woods, but there seems to be a constantly shining light beckoning to us through the trees. We are making progress slowly. In the process of this recession, though, we have become less wealthy. Either from lost jobs, diminished home equity, higher taxes, higher costs of living, education, driving, insuring and unbearable debt loads... There's just less disposable income for spending on what used to be considered necessities and in hindsight seem more like frivolities. Top that with being worried about what the future looks like. Consumer trends -- many of which had started developing before this marketplace turmoil -- have only accelerated. They support a new consumer attitude toward spending: one of frugality, characterized by a "strong value consciousness that dictates trade-offs in price, brand, and convenience." That tells me that the good times of enthusiastic consumer spending are gone. The days of acquiring stuff to replace old stuff that gets placed into storage [paid for in addition to monthly living obligations] are no longer sustainable. Buying the largest McMansion that a mortgage can buy quickly becomes an upkeep nightmare if you can't afford cleaning and maintenance help. Clogging those homes and our lives with more stuff can only suffocate us personally and financially. That puts us in the midst of a purge. Not that we've stopped buying. Rather, we now make considered trade-offs for the best combination of price, brand/quality and convenience. In making prudent trade-offs, we benefit by obtaining more; we focus on how purchases can benefit the community, the environment and contribute to sustainability. We're figuring out how to feel good through our new frugality. So how does all of this affect us in the flooring industry? What does the new consumer frugality mean for those making and selling floor covering products? The New Consumer Frugality means that, although the floor covering business has entered into a more mature phase of growth - i.e., less stuff sold less frequently -- flooring faces an opportunity to redefine the customer experience in terms of how product is sold and what kind of product is sold. That in turn requires new customer-focused commitments. We need to be transparent in our pricing and product claims. Why? Consumers don't trust marketing claims. They readily make use of the Internet to educate themselves, using digital comparison tools and tapping word-of-mouth perspectives. Customers are more likely to trust you if you make it easy for them to do their due diligance. They seek out transparency. We need to be willing to build longterm relationships with customers. With that comes a true commitment to sustainability, a belief in authenticity, a commitement to service and to the local marketplaces we serve. Consumers are tired of being taken advantage of and being considered statistically insignificant when they have complaints. They expect you to be listening and paying attention, especially online, and they have high expectations about the feedback they offer and the interactions with them. They expect you to have meaningful ties to the community and that you think and act sustainably. We must provide a greater focus on product differentiation and quality. Customers are seeking out simplified product offerings. They are time stressed and tired of being deliberately confused. They appreciate that you try to make their lives easier. Edit, curate, add meaning to your product assortment so they can understand the benefits they receive from different product categories and price points. Simplicity is meaningful to your customers. We must be willing to explore new retail and business formats that make use of Internet based disintermediation. Our consumers are also tech savvy, adopting mobile at a very fast rate, and willing to experiment with the likes of an engagement ring iPhone app from Tiffany, or a geolocation gaming application like Foursquare. Be visible digitally and be sure to integrate your online and instore experiences. What's your interpretation? How are you planning for the New Consumer Frugality? Some companies make things happen. Some companies see things happen. Some companies wonder that things happen. Change happens whether you are ready or not. And let's not forget that seven months ago the U.S. dollar was 1-34 against the Euro whereas today it is at 1-19, making US exports around 12% more expensive and therefore less attractive. The Vision Statement: Creating a vision that embraces change. With the continuous changes in our industry you need to have a VISION of what you want to achieve and a route map of how you might achieve it. Remember the DePree quote: “You cannot become what you want to be by remaining what you are.” A vision statement is not cast stone and needs refining at regular intervals. Creating a vision of where you want your company to be in five years is a good place to start and here is how I suggest it can be done. • Create an overview of the competitive landscape affecting your business including key players who influence your ability to compete in the marketplace. • Translate the strategy into an annual P and L for the period of the vision. The completed project can be summarized in a power point presentation of only a dozen slides and presented to various internal groups for comments to receive input and further refinement. You will be amazed at how much you learn about your company (as well as your management) as a result of this process including some things you probably did not want to know. And you’ll have a blueprint that will help you navigate challenges that lie ahead. When complete, I believe it is an excellent idea to present this to your entire workforce, in groups if necessary and with or without profit numbers at your discretion. Employees are always motivated to know the company has a plan for the future. It is also a good idea to present regular updates as to how the plan is working (or is not) so that "VISION 2015" becomes a buzz phrase in the company and employees feel they are part of the process. Remember the line from William Ernest Henley's poem, Invictus: “I am the master of my fate . . ."
Visions statements are crucial and the process is fascinating. If you need my help let me know; and as always, if you have thanks for reading this. How the oil spill disaster may affect the flooring industry.... Will customers start asking new questions? Like you, every day I am sickened by the sight and thought of the BP oil spill. I can no longer even look at the televised live feed showing oil spilling into the gulf. I can’t watch pictures of animals coated and drowning in oil or think of what is happening to the sea life, the ecosystem and the lives of countless people along the coastline. If only we could apply Ctrl Z to life and undo our mistakes the way we can with a computer. I fear we will be living with the consequences of this event for at least the rest of my life. That brings me to my thought today – which is to share an example of one way this oil spill might affect the floor covering industry, and especially retailers. It seems natural that this disaster could heighten the collective concern about the environment. Maybe this disaster will cause some Americans to ask more or different questions about products they buy. Retailers may face some new objections as consumers try to avoid petroleum based products or ask about products that use less manufacturing energy. The answers to these questions are not readily available in most retail showrooms, but maybe they should be. In the very least, maybe this should be something that our product makers and sellers recognize as a possible emerging dialog. Most types of flooring products have been analyzed and "scored." Data is stored and available for designers, builders and manufacturers to use. So the potential question of “What product type typically uses the least energy during manufacturing?” can be answered. The answers are based upon the product's Life Cycle Analysis (LCA). What is a Life Cycle Analysis? A Life Cycle Analysis is a careful accounting and analysis of measurable raw material inputs (including energy), product and by-product outputs and emissions to air, water and land - and they can be much more detailed. One source of LCA data is through an agency within the U.S. Department of Commerce. The National Institute of Standards and Technology (NIST) maintains a data base with environmental and economic performance data for building products, including dozens of floor covering products. Their LCA considers 12 environmental attributes from fossil fuel depletion and indoor air quality to ecological toxicity and the impact of raw material extraction through product manufacture, transportation, installation and disposal. Analysis is based on a uniform set of international guidelines and procedures published by the International Organization for Standardization (ISO). Wood flooring has also been the topic of many studies in the U.S., Canada and Europe. 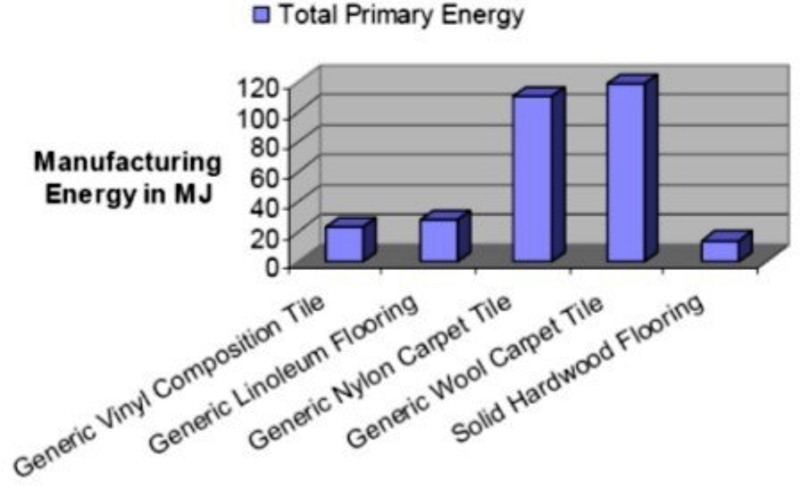 In 2008 The National Wood Flooring Association Industry Research Foundation conducted a life cycle analysis of wood flooring in conjunction with the Consortium for Research on Renewable Materials (CORRIM) entitled: Life-Cycle Inventory of Solid Strip Hardwood Flooring in the Eastern United States. The authors of this study also prepared a supplement in which they compared wood flooring to some other flooring products: How Solid Strip and Sold Plank Hardwood Flooring Stacks Up in Comparison to Alternative Floor Coverings. They looked at air and water emissions, primary energy use and product service life. They concluded that hardwood flooring used the least amount of primary energy in manufacturing, had the longest life expectancy and used substantially less water in manufacturing than other products, with the exception of VCT. 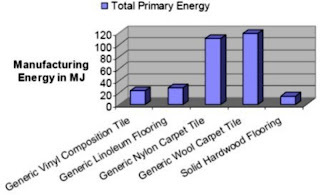 This graph shows their findings of Total Primary Energy Required to Manufacturer Selected Floor Coverings. This same information is contained in the Hardwood Council's American Hardwoods and Life Cycle Assessment: How Selecting Materials Impact Our Lives. Of course other product manufacturers may have energy savings protocols that could enhance or contradict this – and that should be part of their marketing story. For those who want to learn more background on this topic, perhaps a place to start is the 2009 white paper by Dovetail Partners: Life Cycle Assessment of Flooring Materials A Guide to Intelligent Selection. Among the topics covered are: Environmental Performance of Various Floor Covering Options; Performance Rankings (based on the NIST data); and Economic Performance of Various Floor Covering Options. Even if you don't agree with their findings, you are farther ahead knowing about this study. Certainly every manufacturer will have its own interpretation of data, and maybe some have funded their own LCA’s. I hope they make the data available to their distributors and retailers. The point is, you have a right to ask for it. It’s hard to say if this oil spill disaster will make us think differently about the products we buy and use or whether buying decisions will change. As a consumer I know that when I am informed about the differences in products I am empowered to make better choices for me. I appreciate any retailer or supplier with credible information to share during my decision making process. As the oil spill spreads across our beautiful Southern coastline, I hope this post will prompt some of you to think about how you might overcome possible new objections and questions. Thank you for reading and please continue the discussion by posting your comments below. In my April post, “Catalina Says U.S. Flooring Industry Set For Spring Thaw,” I asked readers to let us know if they benefited from improvements in the economy that were anticipated this spring. We received a number of positive responses that business was beginning to improve. 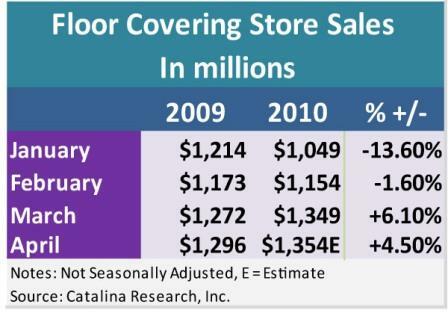 Well the numbers are in, and retail floor covering sales are on the rise. 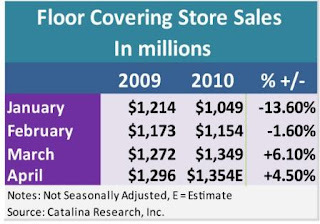 The first increase in floor covering store sales in 29 months came in March this year with a boost of 6.1% over last March, according to the U.S. Department of Commerce monthly retail survey. Based on furniture and home furnishing store sales in April, we think it’s possible that in April floor covering store sales will show a 4.5% increase over the previous year. In the home center channel, Lowe’s and Home Depot are also seeing positive trends. Lowe’s estimates that total second quarter 2010 sales could rise by 5% to 7%, with bigger ticket home improvement purchases leading the way. Home Depot sees sales rising in the 4% to 5% range. In the second quarter of this year we estimate total floor covering retail sales may increase by 4% to 5% and similar increases will continue through the second half of the year. The recovery of floor covering retail sales is tied directly to the increase in existing home sales which reached its highest level in three years this April with a 26.2% surge over last April, according to the National Association of Realtors. From April 2009 to May 2010 existing home sales increased 11.5% with over 550,000 more homes sold in that time compared to the previous twelve-months. These sharp gains are, of course, due to the $8,000 tax credit for first time home buyers. That credit expired on contracts signed by April 30 and closed by June 30 and many are worried that existing home sales, and therefore floor covering retail sales, will decline again due to the expiration of the tax credit. Will Floor Covering Sales Suffer with the Demise of the First-Time Home Buyers’ Tax Credit? • The most important is the turnaround in U.S. employment. U.S. employment rose by over 200,000 this April and is expected to remain positive. This will give a boost to household incomes and lead to rising home improvement spending. • Household ability to spend is also improving. Mortgage rates continue to remain below 5%. This will provide a floor under existing home sales and improve the finances of those refinancing. • Homeowners’ ability to finance home improvements is also expected to increase with the rise in home values and a decrease in debt to income ratio. The average value of an existing homes sold rose by 3% in March and April this year and the household debt to income ratio declined to its lowest level in nine years by the end of 2009. As always, please let us know at the Floor Covering Institute how these positive market conditions are affecting your business. We value your input and enjoy the conversation. You can enter a comment below.